The service based at Barry Hospital is in the process of being refurbished to create a centre appropriate for patients with young onset dementia. The team is seeking help and support from local businesses and the community to help with the project. Often it’s thought that dementia only affects people over 65. But there are an estimated 2,220 younger people, aged between 35 and 64 living with dementia in Wales. Approximately 289 of these live in Cardiff and the Vale. The centre will be modern and age-appropriate to meet the needs of our patient group and will enable patients to move around freely. There will be different areas inside and out for patients and their families to spend quiet time together, participate in group work, listen to music, play games or take part in activities. 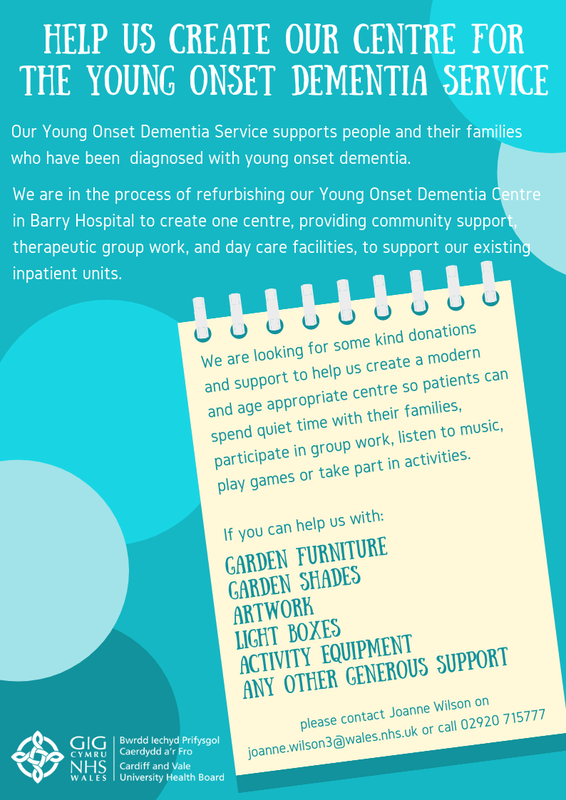 The Young Dementia Service work together with people diagnosed with young onset dementia and their families. Delivering high quality, person focused support to ensure continuity of care and responsiveness to often rapidly changing physical, psychological and social needs. Problems with language, vision, personality or behaviour may feature as early symptoms, rather than memory problems. People are more likely to still be working, have significant financial responsibilities and have children or parents to care for. Remaining socially and physically active is especially important to younger people with dementia. Acuity levels may be greater in young onset dementia, as people are physically more robust. Care alongside elderly frail people may present significant risks. There are very few dedicated Younger Onset Dementia multi-disciplinary teams within the NHS in the UK. Within Cardiff and Vale UHB, our Young Onset Dementia team includes; nursing, occupational therapy, physiotherapy, psychology, dementia care advisor and medical staff. If you can help with; garden furniture and shades, artwork, light boxes, activity equipment and any other support this would be appreciated by all. If you would like to help please contact Joanne Wilson, Directorate Manager on joanne.wilson3@wales.nhs.uk or call 02920 715777.